b)If I start my volume distribution at any time after the opening bell, and watch it for short periods of time, then I'm scalping. You know what a) means from the previous eight threads. What does b) mean? Until now, I have talked about the volume distribution when it starts from the opening bell, and runs until the closing bell, that is regular trading hours. However, there is no reason why you could not start the volume distribution computation at any other time during the day, let it run for say 15 minutes or so, trade off of it, and then restart it again. That's what b) means, and that's what I call scalping. By doing this you are essentially looking at the market statistic over a short time frame and asking the same questions with the same responses as given in the last eight threads. The net result will be, you will be taking many more trades and trading smaller standard deviations. This is what is meant by "trading for ticks rather than points". Scalping requires entries, exits, scale ins, scale outs, reversals and closes with one mouse click, otherwise you will miss the opportunity. To do this, you have to use a DOM (Depth of Market) or something equivalent as part of your trading platform. Watch the video and see how I do scalp trades using the DOM. Addendum: I was going to present a thread on the use of Hold Up Prices (HUP) which I've mentioned many times in these threads. I've decided not to do it now because it's quite complicated and I haven't yet found a simple way to present it. So I am going to delay that presentation until another time. Just a quick tangential question - Have you ever researched 'rolling' distributions for scalping? (I plan to try this at some stage). By rolling I mean using a fixed N period for your indicators. So for example you could use just the last hours data. When a new 2 min bar paints you drop the oldest bar and factor in the newest. Yes, in fact I did try that, but discovered that it didn't add anything to understanding the price action. I watched the movie ... where do you place your stops on that kind of scalps ? Back in the newbie days when things where nice and simple the way I understood it was you would enter at the VWAP with a stop at the PVP? (or was it a couple of ticks the other side perhaps?). You then introduced us to SD's With options of taking a trade there. At this time the stop would still be the PVP with the option of adding to your position at the VWAP. In fact a Whole section was devoted to risk tolerance. Again if I understand this correctly we decide what the maximum amount is we are ever to risk (based on account size) and then use market statistics (VWAP,SD) to enter and the PVP for a stop? All well and good to this point however when you introduced breakout trades and counter trend trades I think a couple of different styles of trade management where also introduced. With BO's you would move the stop to BE as soon as possible? As an aside because BO's break and go you would consider entering these aggresively without waiting for the Shapiro effect? Also the way I understand it you would only do this at a BO of the SD band. A BO through the VWAP would be managed normally? With countertrend trades (symmetric distribution) you offer a couple of choices for stops - add 1 at the SD2 for a return to SD. -or- Stop and reverse if your trade moves against you for a journey to SD2 (I guess you are switching from counter trend to BO)? Does this sound correct? Things are certainly a bit more complex than when newbie started out! Another thing about the Shapiro effect - if the tigger bar (the bar that touches the band) is of a wide range, we can end up giving away a lot of potential profit and adding to our risk (as your stop must be further). For example for a short at the VWAP if the bar comes from halfway between the SD1 & VWAP we give up half the potential profit and our stop is correspondingly further away while we wait for the low of this bar to be broken. Do you pass those trades or maybe not use Shapiro, or maybe drop down a timeframe for a more precise entry? P.S. great scalping video (closet scalper here). Jerry, what is the name of your DOM software again?I missed it twice now when you said it, that looks really nice. Also, do you do anything as far as keeping this information on a yearly chart for stocks if you wanted to buy a stock for a roth or what not? Do the same concepts apply if your looking at daily data? I think its ZeroLine trader Darth. Ive heard lots of good things about it. I use Bracket Trader which works well for me. Don't have the energy to try a new setup just now. Yes. Simple trade simple stop. Only 1 complication. Profit target was arbitrary. Correct. Still reasonably straight forward. I probably should have introduced the Shapiro Effect at this time to help eliminate bad entries. Yes this is essentially correct. Break outs are difficult to trade under any circumstances. It's still possible to use the Shapiro Effect if you get a retrace. If not, tough luck. With countertrend trades (symmetric distribution) you offer a couple of choices for stops - add 1 at the SD2 for a return to SD. -or- Stop and reverse if your trade moves against you for a journey to SD2 (I guess you are switching from counter trend to BO) Does this sound correct? Things are certainly a bit more complex than when newbie started out!? Correct again. As you are seeing, the trade threads get more and more complicated and more difficult to manage. This does not mean you have to expose yourself to these more difficult trade setups, but you should be aware they exist. One other thing you mentioned briefly (can't remember where) I seem to recall you mentioning those with low risk tolerance could put the stop behind the Shapiro bar? Maybe I dreamt that. I did say that, for those who feel queasy about risk tolerance trading. The Shapiro effect is a two edged sword. You don't get something for nothing here. If you use it, as you point out, you will decrease your profit potential and increase your risk. And yes, you can drop down a time frame to find a better entry point. Sounds like you've got the statistics down pat, NICK. Now all you have to do is trade it and see how it works out for you. The Interactive Brokers front end is from http://www.zerolinetrader.com. Use a player like Nick suggested for easier replay of the videos. Yes, it should be useful for stock daily data. I look at a 1 year chart with the PVP and VWAP on it for the various futures I trade. I took a stab at fixing the program bugs that stopped my tick chart from displaying correctly, and during the evening I replayed intraday charts using both tick charts and chart with 5 min candles. What I observe is that one can use the tick charts to trade the pre-open and open (first 30 to 45 minutes), watching the market develop and taking a few quick scalps. You can then "switch over" to the longer term chart (2-5 minute candles in my case) and not feel as though you "missed" the open..Just a thought. Yes Steve, that's one way to trade the open. I usually use a 15 second chart on the open and watch to see if there is a NEWBIE entry for a quicky. Yes and I think we can take this a little further than just the open. It seems that one can use the shorter term chart to trade those "in between" times when the skew is does not show direction (skew = 0). Or when a sudden shift of the skew occurs, looking at the shorter term chart (for me it is either a 1 minute chart or 200ticks) lets you re-orient yourself and prepare for a possible reversal. We had a good example just now on the ES contract where the skew shifted, I changed over to the 1 minute chart and took the long entry around 1448 looking for a scalp profit at the 1 SD (about 1449). In fact the move continued on up to 1452 (a previous "HUP"). Previous "HUP" areas seem to act like magnets or pivots and in this case price has stopped there at least momentarilly. Good show Steve. Keep up the good trading. Thanks Jerry, your generous work here makes it possible for me to improve. So what I would like to do is give a little bit back..One technique I use profitably is to look at a 60 min chart of the previous day's action, noting where the wide range bars exist. Wherever I see a "wide range bar" I calculate the midpoint and put a horizontal line through it. These lines serve as "test points". That is to say, I look for today's price to test these lines and also they serve as profit targets helping me to stay in a trade longer. 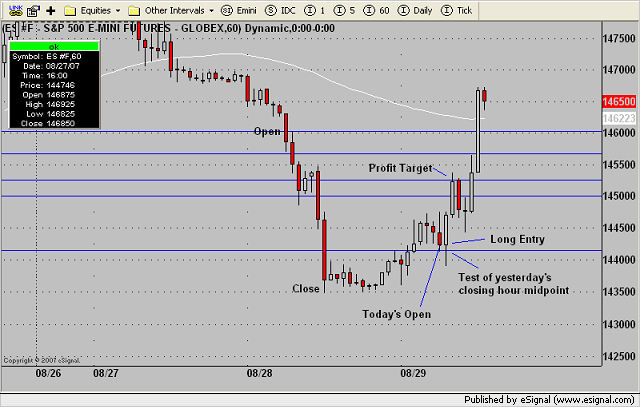 The attached chart shows one example of a trade using the midpoints of the previous day's wide range bars. There were several such trades possible today. This seems to work well for both futures and equities. The general concept is that the midpoint of wide range bars serves as both support and resistance. I guess you are still considering how to present HUP's....gives you a well earned weekend off I guess! Still I missed my 'trading with market statistics' fix. In the meantime one thing that I am still considering is when to take breakout trades and when to take counter trend trades. (of course when in doubt stay out is also an option too). I know BO trades should be from the bands wrapping round the PvP. Counter trends when PvP & VWAP are 'close'. There are situations where both look like valid possibilities? actually I was hoping maybe a few more examples might help if HUP's are a way off. (scalp charts are perhaps good for this as things happen 'quickly'). Forgive me being presumptuous. Also it seems to me that there is case to be made for a trade you have not mentioned (yet at least). This is a counter trend trade when price is a 'long long way' from the VWAP (and possibly the PvP). For example if price is outside the 3SD and moves back in. Risky again because an 'overbought' market (not a concept I necessarily buy into) can remain 'overbought' for a very long time. Guess we can open a scalp chart and find a trend trade (that is counter trend to the 2 minute of the day). I don't know when I will get to discussing HUP in detail. Next week I will be away for most of the week, and the the week after I'm heading off to China for 3 weeks. So you won't hear from me for quite a while. The break out trades occur when price action is near the PVP Nick. If you have the situation where the PVP is also near the VWAP at the same time, you do nothing. Just sit and watch. Also it seems to me that there is case to be made for a trade you have not mentioned (yet at least). This is a counter trend trade when price is a 'long long way' from the VWAP (and possibly the PvP). For example if price is outside the 3SD and moves back in. Yes, that is correct. In fact Cooter mentioned this one early on. I usually don't do anything when the market reaches the third standard deviation. It's a tough call. 1) does the price bar have to make a "floater" above the SD band before the pb bar qualifies as a Shapiro bar? Or does 1 bar just have to close > the SD band and the next bar that reverses under the SD band is the Shapiro bar even without an earlier "floater" above the band? 2) what if there are successive bars that sit right on the SD band with Close < Open but the HIGHs keep getting LOWer. Do you use the last bar HIGH and keep moving the entry price LOWer or is the 1st bar that crossed the SD line used as the HIGH/entry price? The last down bar that touches the SD is your test bar. Doesn't matter where or how it touches. The simplest situation would be 1 down bar touches SD. Next bar has a price higher than the high of that down bar. More complex situations would be several down bars touching SD. Next up bar does not have a price higher than the last down bar high. But the one after that does. Pull the trigger on that second up bar. It is also possible that your entry bar which looks like it is going to be an up bar and you pull the trigger long, eventually turns out to be another down bar. Tough luck. When you set up a new volume distribution time frame, using your example of 15 minutes, do you also reset the VWAP to the new time or do you let the VWAP continue fron the previous time frame. The VWAP is for the time shown. So if you are displaying 15 minutes of data, then the VWAP is computed starting 15 minutes ago. I just want to let you know that this is a great thread that you started you have opened up my eyes with regards to the statistics side of trading. Do you use the same strategy for larger time frames like on the one hour, daily, weekly charts? Yes Simon, you can use Market Statistics for analyzing the data for any time frame that you like. You will note of course that for longer time frames the standard deviations get larger so that your risk (as well as reward) increases. Specific to scalping I have found that fading the trend at either 2nd SD to be most effective - can anyone confirm or refute this claim?